K'inich Yax K'uk' Mo' (KYKM) founded a Copan dynasty that ruled for nearly 400 years from AD 426 to 820. T. Douglas Price of the University of Wisconsin - Madison and Robert J. Sharer of the University of Pennsylvania excavated his tomb and subjected his remains to isotopic analysis to determine where he grew up. They concluded that he probably spent his adolescent years at Tikal which is 268 air kilometers NNW of Copan. Hieroglyphs at Copan deciphered more than 25 years ago referred to him as a foreigner. David Stuart of the University of Texas - Austin found an inscription in 2007 at Copan that refers to him as a lord of Caracol. 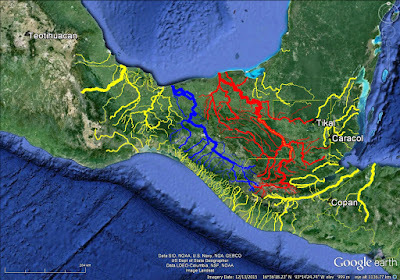 Arlen & Diane Chase of the University of Central Florida - Orlando have found evidence that by AD 150 Caracol had extensive ties to settlements near Copan. Price and Sharer interpreted offerings in KYKM's tomb to mean he had strong ties to both Tikal and Teotihuacan. Teotihuacan, 1,164 air kilometers WNW of Copan, established some form of hegemony over Tikal and many other classic Maya sites beginning with the famous Entrada of AD 378. 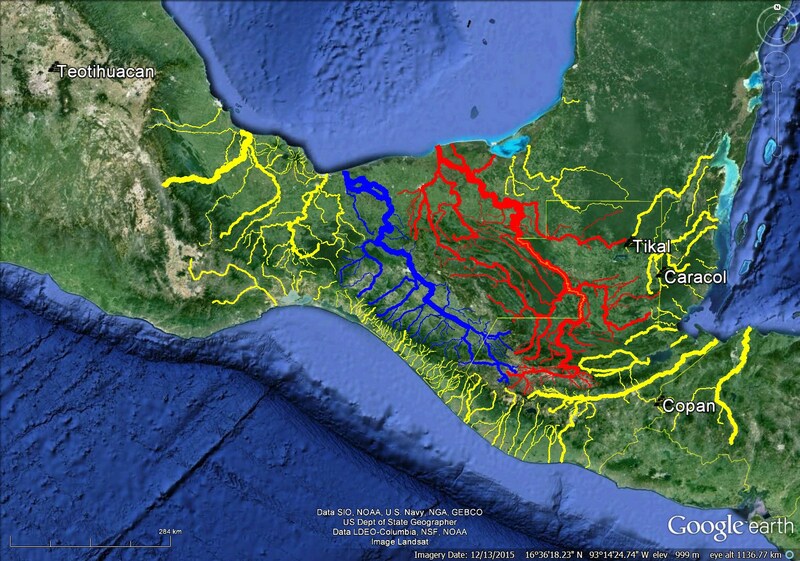 These kinds of long-distance connections are changing the way we speak of the Maya. Long thought to be independent city states with shared cultural characteristics, current scholars are now using some form of the term "colony" to describe Maya social and political relationships. Most stelae dedicated throughout the Maya colonials are plain. Elizabeth A. Newsome, "The Ontology of Being and Spiritual Power in the Stone Monument Cults of the Lowland Maya." RES: Anthropology and Aesthetics, Vol. 33, Autumn 1998. Copan is an example of colonial expansion from the central Maya lowlands. T. Douglas Price, James H. Burton, Robert J. Sharer, Jane E. Bulkstra, Lori E. Wright, Loa P. Traxler, and Katherine A. Miller, "Kings and Commoners at Copan: Isotopic Evidence for Origins and Movement in the Classic Maya Period," Journal of Anthropological Archaeology Vol. 29, Issue 1, March 2010. This is all very good news for the Book of Mormon which posits politically dependent relationships between distant polities. For example, Ammonihah and Noah both depended on Zarahemla for their defense Alma 16:2-3. This is also good news for the January 2016 Book of Mormon Lands Map which assumes both the Nephites and Lamanites operated over scattered territory hundreds of kilometers in extent. The text of the Book of Mormon is plausible in its proposed setting.